Last week I wrote to show you how to trade in the Trump Era: The Techno Funda Way. One week later, the situation is no different - Trump is still callously spewing venom against China. And he isn't stopping there. Russia is the new target. You know the old proverb: When elephants fight, the grass gets trampled? Well, the markets are certainly getting run all over by these fighting nations. Nevertheless, we will let the world leaders have their fun and games; and focus, instead, on how you can pick the best of the best stocks in such turbulent markets. The process of picking stocks I'm going to share with you is formulated from having closely worked with institutions in the past, and tracking their success to generate money in challenging, difficult environments by trading in only the best fundamental stocks. Some choose to trade only in sectors which were doing well. Some trade only in the best 20 stocks of the Nifty 50 basket. No matter what your trading style, everyone can use the techno-funda approach. When I joined Equitymaster in November 2014, I knew that the best available research out there is Equitymaster's fundamental research. With access to all Equitymaster-recommended stocks, all I had to do was apply technical filters. You might have never heard about these Retirement Lies which are causing many people to live a mediocre retired life. These Lies, created by our "System", could sabotage one's retirement. But today we're going to expose these Lies and guide you - how you could possibly live better in retirement than you do now. In fact, so much better that you could potentially retire early and wealthy! Click here to find out… what we're going to reveal today. StockSelect - identifies safe blue-chip stocks that subscribers could count on over a long term. It is the longest running Equitymaster service with a successful track record of more than 15 years. At the moment, there are 19 open recommendations in this service. The India Letter - plugs the gap between the negative developments engulfing the Indian economy...and what you need to do to protect yourself, and even profit from it. It is a perfect platform to help you connect the dots between the 'big picture' views and 'big profit' stock ideas. The team has identified 34 stocks which fits the criteria. Hidden Treasure - identifies small cap stocks with strong moats, good fundamentals, and solid managements that are available at attractive valuations. The stocks that qualify are recommended with a horizon of 3-5 years. The team uses a proprietary tool - Equitymaster Risk Matrix (ERM®) for an objective and thorough risk analysis of these smallcap companies. Right now, there are 25 companies which have gone through the ERM® and are live recommendations. Smart Money Secrets - tracks the investments of what they believe are India's 40+ Super Investors which includes exceptional Fund Managers, Investing Gurus and Promoters. Their aim is to get in early and then just "ride along" with these investing gurus towards solid profits. This is Equitymaster's latest stock recommendation service with 10 open recommendations. Microcap Millionaires - identifies stocks--where the downside to upside ratio is firmly in favour of the subscribers--that could lead to generating strong returns from fundamentally strong but attractively valued microcaps. The service which uses definite rule for buying as well as selling has 8 open recommendations now. Profit Velocity - is based on Newton's first law of motion which believes that stocks with high past returns tend to have high future returns. It aims to recommend mid and small cap stocks that have had the best returns over the last one year and are also blessed with strong fundamentals. This super active service has 15 open recommendations now. There are about 141 stock recommendations across all the above services. Some of them are common and recommended in two or more services...which is good as it means the stock has gone through two very different set of investment filters and processes. Overall, there are 127 unique stocks which the Equitymaster team has recommended. These are live as I wrote this letter. I include all stocks that are recommended with an average liquidity criteria of Rs 5 million in my universe. Finally, I will recommend stocks which pass both the filters with a maximum buy price along with target and stoploss percentages. I have been using this strategy to recommend best trading ideas to my Profit Hunter Pro subscribers for the last five months. And the strategy has worked wonders for us. Some of our recommendations have generated gains like 12.2% in 20 days, 14.39% in 24 days, 20% and 10.73% in about 2 months. By now, I am sure you may be wondering how you can use the same approach...You may not be a subscriber to any of these services...or you might have only a few of them...or you may not know how to use the technical tools for trading. You don't have to worry about any of this. We have a solution for you. 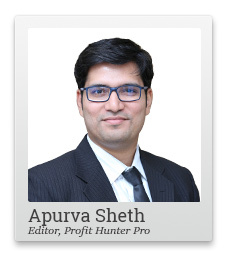 PS: Apurva's brilliant systems and simple recommending style have made him very popular with his susbcribers. Join the ranks of Profit Hunter Pro by subscribing here. Equitymaster requests your view! 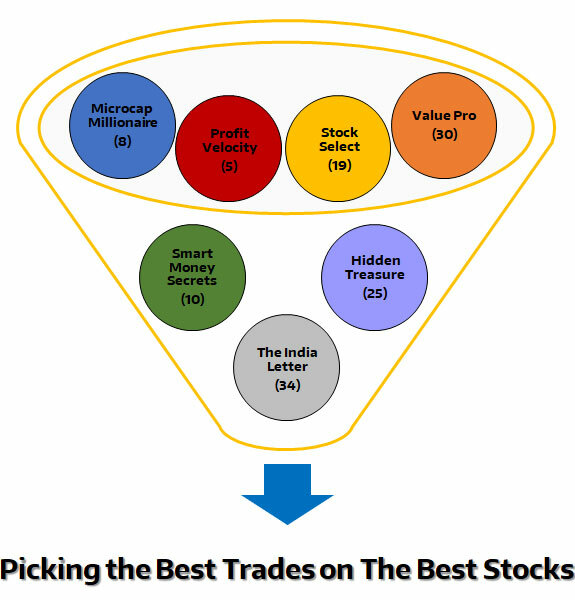 Post a comment on "Pick Best of The Best Stocks...Irrespective of Trade Wars". Click here!